Expanding the reach of PESA’s efforts to highlight innovation in the oilfield, PESA President Leslie Beyer delivered the keynote address to a gathering of mayors from leading energy-focused cities as part of the World Energy Cities Partnership’s Annual Corporate Luncheon during OTC Week in Houston. Beyer encouraged each of the mayors to embrace the oil and gas service, supply, and manufacturing companies in their cities as innovators and as leaders in the innovation economy. 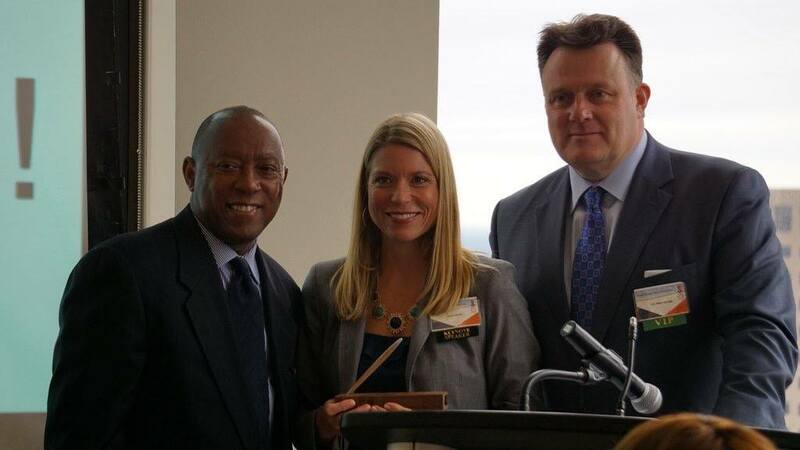 PESA President Leslie Beyer with Sylvester Turner, Mayor of Houston and Halifax Mayor Michael Savage of WECP. Today, I’d like to talk a little bit about the global innovation economy, and how the energy industry – specifically the oilfield service and supply sector that I represent – is a key player in this. We’ll also discuss how trade associations including my organization, PESA, which is the Petroleum Equipment & Services Association, support and promote that innovation in your cities and around the world. Every January, attendees flock to Las Vegas to see the latest innovations at the Consumer Electronics Show. This year, smarter TVs, advances in self-driving cars, and refrigerators that allow you to read your e-mail while you are deciding whether or not to have that late night snack received all the headlines. Longer videos in Facebook and even another round of smartwatches than can finally track all your steps on the elliptical are also hot items at CES. If you were to watch the news…or more likely take a look at your Facebook or Twitter feed…it would be pretty clear from all reports that the consumer is the focus of cutting edge innovation. And cities around the globe, probably even some represented in this room, are working to tap into that excitement and build their own innovation economy. Here in the U.S., Washington, DC is now competing with Austin and Silicon Valley for growth in tech jobs, and Houston is home to several successful startups that are using smartphone applications to improve healthcare and other areas. Yet, you all know that innovation isn’t only happening on a drone, your wrist or your refrigerator. The world’s energy innovators are gathered here in Houston this week for the Offshore Technology Conference. The technologies developed by innovators on the show floor at OTC directly or indirectly make possible every single piece of technology at CES, every app on your phone, and every online shopping order you place. And it isn’t just the technology we interact with every day that depends upon the innovations from these oilfield service and manufacturing companies: health care, transportation, and other ground-breaking disciplines are dependent upon energy innovators, as is modern society. It’s time to recognize energy innovators as part of the innovation economy and the work that they are doing drive the possibility of all other technological advances. You won’t find a new way for your teenagers to message each other here at OTC, but you will find technologies that allow scientists to practically see and manipulate machinery within inches of a target ten thousand feet underground. You won’t see a t-shirt that tells you when you need to drink water during exercise, but you will find equipment that safely operates at deepwater pressures and temperatures more extreme than the outer stratosphere of Earth. You won’t happen upon a panel discussion about whether Star Wars or Star Trek is responsible for the smartphone, but you will hear about new advances in ROVs that turn science fiction into real life. Oilfield service and manufacturing companies are producing game-changing technologies every day, many of them leading to the discoveries that make modern life more efficient. Yet, the continued progress of that innovation, specifically in oil and gas, is in many ways under threat. Well-funded campaigns push a message of “keep it in the ground” and are focused on the notion that oil and natural gas are dirty energy sources, something that we should end our societal addiction to immediately. What would the consequences of such a policy be? Can we just replace the energy resources provided by oil and natural gas with more solar panels and wind farms? Even under the most optimistic forecasts, with the highest possible levels of government subsidies, such a transition would have significant negative consequences for the global economy and for quality of life in the developed and developing world. Reliable energy is not simply necessary for economic development – it is critical to addressing disease prevention and treatment, reducing infant mortality rates, and growing life-sustaining crops. When thought of that way, the innovation of the oil and gas industry is truly serving a higher purpose – certainly higher than the development of a new algorithm to help you find specific movies on Netflix. To that end – Our mission at PESA, and many other energy trade associations, is to promote all that oilfield service, supply, and manufacturing companies are doing to lead innovation across the industry. We work to elevate the understanding that these companies are actively developing tools and technology to harness our resources safer, more efficiently and with a smaller environmental footprint. Some companies at OTC are collaborating together, using technologies like seismic, which you all know is used to find oil and gas deposits, with other digital applications to make inspections of subsea systems faster and more accurate. Onshore, several companies are taking the injected water from hydraulic fracturing, recycling it and finding new uses in other industries. Recent data has shown that while our economy continues to grow, emissions are falling – not simply because of focus on renewable energy sources like wind and solar, but because of smarter and more efficient development of natural gas and advances in refining. Do we have room for further improvements? Of course. As mayors, you are working to make your cities better and stronger every day. That same desire to improve drives our industry, and has been part of the oilfield from its earliest days. Oilfield equipment, growing increasingly stronger in automation and digitalization, is now run by techno-savvy operators and IT personnel, which is perfect to attract a younger generation that was raised up on a diet of computers and video games. Young people coming into the oil and gas industry today will be those with knowledge in process automation, process-domain expertise, data management, cyber security and interface design. Our industry is on the verge of the most dramatic demographic shift in its history, and change is inevitable. Many of you have heard of this impending “great crew change.” Thousands of oil & gas professionals will be retiring soon, creating openings for this group of younger, more technically-savvy, professional operators. And when you think about attracting these millennials to your cities to drive innovation, remember that the energy industry, specifically oilfield service providers, are every bit as appropriate for this skills set as other technology companies. All this brings me to the next part of our discussion. How do we as trade associations support and promote the reality of this innovation in our industry? PESA and many others work to engage with local, state and federal policymakers about legislation and regulations that will impact our business, working to maintain an open dialogue between a collective group of member companies and the government entities that oversee and regulate the oil and gas industry. We support education programs at the elementary, high-school and undergraduate levels to promote STEM disciplines that drive the industry, and we create workforce development programs to cultivate our oilfield personnel, developing their skills and competitiveness with trainings. The message of innovation and the importance of the work of our sector is a key part of each of these areas of focus. I’ll speak a little about what we do in each of these areas and highlight a few examples. In terms of engagement with policymakers – PESA and other trade associations coordinate meetings between their member company technical experts and federal regulators to provide input on regulations and legislation, focused on avoiding any unintended safety or operational consequences for the industry. Every trade association approaches their engagement with regulators and policymakers differently. At PESA, we strive to be a trusted resource to our state and local governments, providing technical expertise and education. What matters, especially during times like this when the industry is experiencing such a challenging commodities market, is to continue to be engaged and promote dialogue between industry and government entities at all levels. Building on this, and through an exclusive partnership with the US State Department, PESA regularly provides industry training to foreign and civil service officers posted in energy intensive countries. They spend a week in Houston with our members, gaining exposure to every element of the industry and providing us with an inside perspective of industry activity in their respective countries. This program provides a unique and collaborative way for us to highlight the important work that we do and educate our government officials that work with the industry, fostering strong relationships that will only benefit government entities, our international partners and industry as well. As we speak right now, some of our members and staff, working with the U.S. Department of Commerce and Department of State, are escorting a delegation of international energy leaders and Ambassadors from energy-intensive countries to see first-hand the latest innovations here at OTC. That work, and programs like the World Energy Cities Partnership show that trade groups can promote important links between individual companies and government entities, developing these critical relationships. But just talking about innovation doesn’t make it happen. That’s why PESA is also focused on two other critical areas: energy education and workforce development. You’re all aware of the many challenges facing education, especially when it comes to the STEM-based disciplines that drive the innovation economy. We at PESA are involved in a range of energy education programs designed to provide children and young adults a strong foundation in STEM-based disciplines at multiple levels, furthering awareness of the oil and gas industry’s fundamental contributions to global society and promoting competitiveness in the industry. At the elementary and middle school level, we work with the Offshore Energy Center and schools across the US to deliver on-campus field trips through Mobile Oilfield Learning Units (MOLU’s). The MOLU is a traveling exhibit that features curriculum-based, hands-on activities about energy, and the technologies and sciences involved with the oil and natural gas industry. Instead of reading about these topics from a book or watching a video, the MOLU enables students to experience them first-hand and learn by discovery instead of by lecture. At the high-school level, we support 5 Petroleum Academies in Houston and Ft. Worth, TX, and the first-of-its-kind Energy Institute High School, a full magnet high school in the Houston Independent School District dedicated entirely to the development of the geosciences, alternative energy, and offshore technology. The Petroleum Academies and Energy Institute provide students with a learning experience in the concepts needed to pursue careers in engineering, geology, geophysics, and global energy management. But no matter what field they choose, this experience provides a platform for all students to become innovators. And at the undergraduate level, Rice University’s Center for Civic Leadership has created a PESA Fellowship, which consists of undergraduate internships with our member companies geared towards exposing engineering students to the social responsibility, sustainability, safety and environmental efforts of the oil and natural gas industry. It is essential that we continue to cultivate and educate the next generation of oilfield employees, and very often it is trade groups that support this investment in innovation for the future. To support our sector’s pipeline for innovation today, energy trade groups are continually providing member company personnel with best practices, technical trainings, and relationship building opportunities, growing talent in difficult market conditions where internal resources for these activities might not be available. These are similar to efforts occurring in cities that bring innovators together to build networks and set the stage for future growth. In a specific program example, PESA has an Emerging Leaders Committee comprised of one top-performing nominee from each member company. This group receives additional benefits such as executive coaching; mentorship with top PESA executives; small roundtable discussions with industry leaders; and higher-level networking events. By all accounts, the emerging leaders program has truly impacted the professional development of many of our members, reporting greater commitment to their companies for supporting their participation in the program. This is the group that will lead the great crew change that I mentioned earlier, leading their respective companies’ future innovations and success. We are focused on their development, which means good things for their companies and the communities where they are located. Those are just a few examples of what we can do as organizations that support the energy industry, but it’s important to recognize that none of these efforts stop at the end of company property – they involve outreach into our communities. I mention this because, as I close, I want to get back to the notion of the oil and gas industry as key innovators in the global innovation economy, and especially as an innovation leader in your cities. Now if you were to ask the average person who doesn’t know much about the oil and gas industry, they would probably tell you the only place such an “innovation ecosystem” is possible is when it is built around companies like Google, Tesla, or Apple. But look at the oil and gas service and supply sector – we have all those assets and more. We are constantly looking forward, developing better, more efficient, and safer ways to solve some of the biggest challenges we as humans face. The work of energy innovators, who are in your community, could spark the next medical advance or major digital breakthrough. Who knows, the technology behind the remote monitoring of drilling rigs around the world could be the key to the next Facebook platform or Fitbit device application. While the work of our sector doesn’t get all the press or flashy headlines, innovation is central to the oilfield. So what can you do to support this, as leaders of the world’s largest energy-intensive cities? You can be proud to highlight the innovation our sector is doing in your cities and work to attract more companies engaged in the oilfield service and supply sector. You can encourage other innovators in your cities to look at our sector as peers, and as potential partners. You can help the companies in the oilfield to embrace their role as innovators. For as much as I have talked about it, historically our industry has never gloated about their accomplishments and contributions. But we are beginning to advocate more for ourselves more now and we could use your help. Finally, you can remind the citizens of your cities that the innovative work of our sector makes modern society possible. Even though our industry is facing challenging economics, this commitment to innovation does not stop. We’re proud of our legacy as innovators, and I’m honored to work in an industry that does so much to support and improve modern life for millions around the world each day.